Whether you’re teaching five year-olds or fifty-five year-olds, you could use this interactive map to talk about collaborative working across the nations of Europe. European Researchers’ Night takes place all over Europe (and beyond) every year on the last Friday in September. This year, science events are happening on Friday 26 September in around 300 cities located in 24 European and neighbouring countries. The University of York successfully submitted a bid on behalf of the city of York to the EU to host a European Researchers Night, so for the first time York will join more than 300 cities in 28 countries across Europe in showcasing the impact of research. York is one of only four locations across the UK to join in this exciting initiative. The idea is that people of all ages should visit as many of the 20 venues as possible to take part in 80 events ranging from ‘taster’ lectures to hands-on workshops, tours and demonstrations. The full programme which demonstrates a broad spectrum of expertise across the University and research will be presented across six major themes: Our City /Fair Society /Digital/Health /Smart and Green /Food and can be viewed on www.yornight.com. In London the event Afterhours Science uncovered takes place at the National History Museum between 3-10.30pm. See if there is an event near to you! I believe in linking the learning of a language purposefully with other subjects and I hope that we will see more future scientists taking a language at A level alongside their science subjects. Geography teaching develops ‘locational knowledge’ a key part of the new Programme of Study even in Key Stage 1 and this growing knowledge and understanding continues throughout primary and secondary schooling and beyond, in fact lifelong, doesn’t it? So the use of maps like the interactive one I mentioned earlier can be so beneficial. 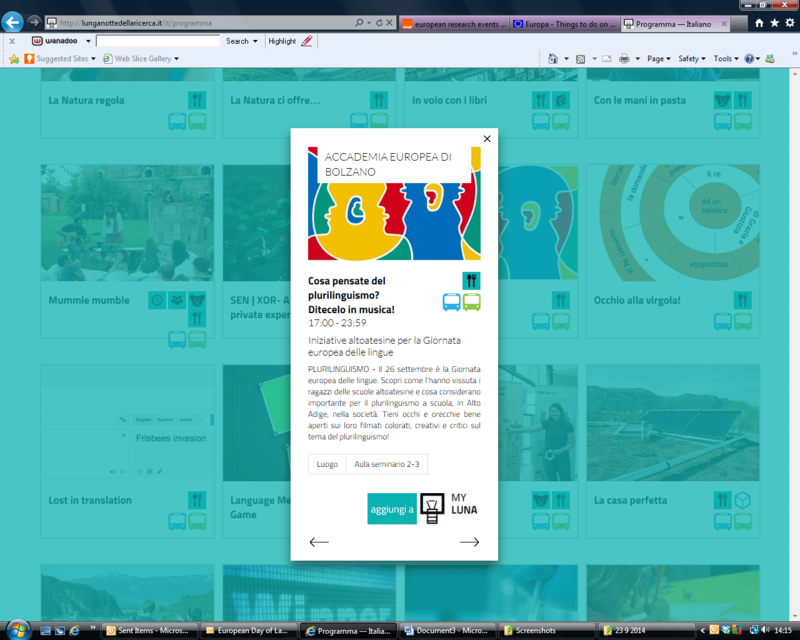 It is a brilliant tool for the languages classroom. You could ask a confident learner (or even two or three) to spend a few minutes at the whiteboard leading this part of the lesson and asking questions in the target language about the different countries and their location (which countries border onto them etc.). Look at these screen shots of events in Bolzano and Madrid. Using a screenshot or a description of an online clip could be a short language lesson in itself and encourage purposeful reading on the internet in other languages. Online searches demand that pupils have to work out unknown vocabulary! Continuing the search on the map and clicking on the countries will take you from the EU site to YouTube La Nuit européenne des chercheurs 2014 (OFFICIEL), to explore what is going on in France, to events in Germany, amongst many others. . You might also like to take a look at the clip European Researchers’ Night 2014 BS: Zeig was in uns steckt. Any Germanists please listen. I just love what they are saying! ← See the world of The Boxtrolls come to life!